Simple, fun, delicious meals for people on the go! If there were an official membership in the “I Hate Cilantro” club, my husband would pay lifelong dues. A few years ago, we were invited to a friend’s house for cocktails. I brought along marinated shrimp to add to the munchies. My better half tore into the bowl, heaping his plate with the shrimp, for there aren’t many things better to him than shrimp of most any variety. As he began to eat them one at a time, I noticed a strange look on his face. With each shrimp, the pace became slower and the look became stranger. When we got home that evening, he asked what in the world I put in that shrimp. “I hope I don’t get sick off of those things. I mean they were bad.” He meant bad in the “spoiled” sense of the word, not just that they tasted bad, which happened to also be the case. After some thought, we realized that it was the cilantro. At the time, he had never eaten the very pungent leaf before. Though generally not a person who enjoys drama, I have seen him break out in a very dramatic Shakespearian-ish monologue over his distaste for the plant. Searching the Internet for any information he could find about why he hated it so, considering that he will eat most anything else, my trooper husband found a website that made him feel validated. He would never again be alone. If you are one of those cilantro haters, go to www.ihatecilantro.com and join the club! If you love the stuff, then by all means add it to this crunchy, refreshing, and super-easy-to-make Southwestern Salad. 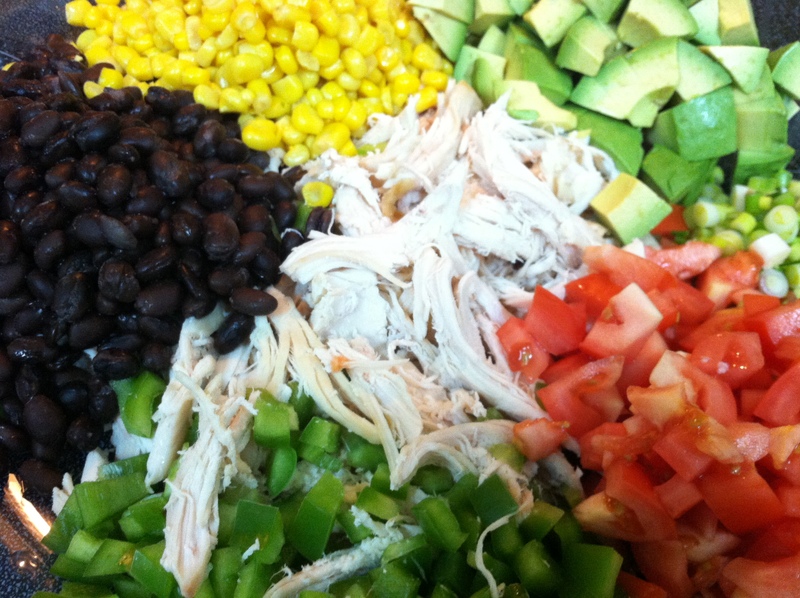 In a large bowl, combine all salad ingredients together, excluding the tortilla chips. In a small bowl stir all dressing ingredients together. Pour dressing over salad, starting with about half of the dressing, then continue adding until salad consistency is to your liking. Top with crushed tortilla chips. If you will have leftovers, add chips to individual servings. Sounds delicious, but like Karl, I will not be adding cilantro! I’m checking out the website!!! I love the story behind the recipe!